AMID the deafening cheers and chants from the Kevin faithful, one could easily have confused the ALP's post-election event as a Ruddy victory party. Even the former prime minister commented on his unwavering support despite the obvious defeat when he finally made it to the stage. "Geez, I thought we'd lost," he quipped. 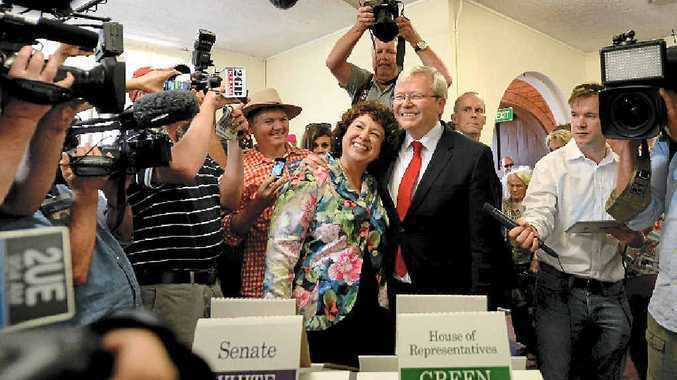 Pausing, in typical Rudd fashion, with his trademark jaw-dropped grin he revelled in the unfaltering devotion. But he probably needed that final boost from his fans before stepping into obscurity, possibly even forcing a by-election if he ditches his politics career. His move to step down as ALP leader seemed gracious enough, if inevitable. But when wishing Tony Abbott well as this nation's new leader his undertone suggested the PM-elect was not up to the top job. And telling Griffith opponent Bill Glasson "eat your heart out" was, as Rudd prefaced, un-prime ministerial, if not downright rude. Not that you'd have known it in a room of people hanging on his every word. Before he arrived, those same people had cheered at every ALP-held seat, booed at LNP wins and, like, the rest of us, murmured in surprise at Clive Palmer. Anticipating a pity party based bad polls, the otherwise overwhelmingly positive vibe was surprising. Those ALP supporters are a proud bunch. History shows the party will rise again. No point dwelling, I guess.